1-4pm Sun Aug 5th and Sun Aug 12th and an hour before auction. Historic Lone Pine Camp located in Keene Valley in the Adirondacks. The approx 20.5 acres includes several buildings that maintain their original looks and details. This unique property is being sold with all furnishings. 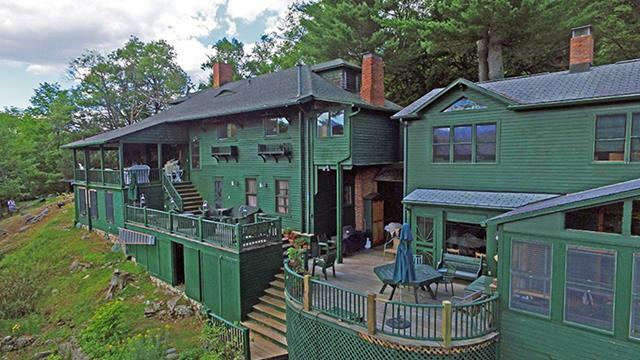 Beautiful 180 degree mountain views, covered porch and large upper deck. 11 bedrooms, 7 bathrooms and 7,000+/- sf 2-story home with wood beam interior. Great room has large stone fireplace and sun porch area. Kitchen includes butler's pantry and large dining area with walls of windows and vaulted ceiling, as well as a separate dining room with fireplace. Office/den, basement and detached garage. Other features include an invisible fence, year-round cottage, cook house and walking trails. Built in 1900. Taxes approx $12,886 ('17). • Shared Element Disclosure. Buyer acknowledges and understands that Property has a shared road with appurtenant/adjacent neighbors. Buyer agrees to keep open and unobstructed for its use therein.